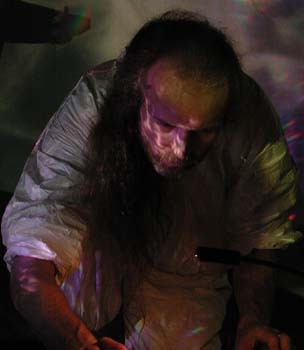 currently an active member in the dreamSTATE, SADU and NOiNO ambient and experimental music projects. Modern Times (MX) and soon after in 1986 began plugging in with Canadian synthesizer pioneers Radio Silence. to include a bounty of software based synths, effects and virtual wires so recordings began to pile up and URM was born. producing and curating Toronto's THE AMBiENT PiNG concert series since 2000.
to the light painting projections of General Chaos Visuals live at THE AMBiENT PiNG in Toronto's Array Space. All music was generated in real time utilizing a virtual studio of synthesizers, effect units and step sequencers. Light paintings were also projected and created in real time utilizing hand painted gels and analog projectors. and light paintings which makes it a very psychedelic experience - like a concert being held inside a lava lamp. created in real time with 11 iterations of Native Instruments' Absynth 1.
five ambient compositions created with Propellerhead's Reason 1 software. which randomly weaves looping synthesized parts into an evolving texture. released as a free, high-quality mp3 album on the ping things label. "Synthphonics 1 - Darkness on the Edge of Light is a sound environment by URM - a project by Jamie Todd, of dreamSTATE. He recorded it with the Absynth soft synth. The process involves sustaining a single note then modulating and mixing it in real time. (In simpler terms, that means warping the sh!t out of the note!) This is superb electronic minimalism. It is the complete package from the opening iteration to the mechanical repetitions. The atmospheres are the soundscapes. The metallic textures and sci-fi sounds take this long-form (55') composition into the isolationism of deep space. This is an essential disc!" "Synthphonics 1 is a fascinating study in dark ambient textures created by Jamie Todd of dreamSTATE. Using the Absynth software program recorded and mixed in real time, Jamie has made a beautifully textured long form piece filled with subtle charms and deep, murky spaces. Constantly evolving and shifting, moving in an almost organic way, Synthphonics 1 is a wonderful disc to explore and a must for any fans of the dark ambient genre." "Synthphonics 2 - Hush on the Peace Terrain - Jamie Todd of dreamSTATE returns with the second volume in his Synthphonics series, Hush on the Peace Terrain. Utilizing the Reason software system, Jamie has created a lush and emotional series of soundscapes linked conceptually by recent world events. Unlike its predecessor, Hush... uses shorter pieces of differing thematic natures to tell it's story, and while maintaining a link in terms of sound, each piece retains a distinct personality and identity indicative of a particular instant. From the quiet movement of Dawn into the shifting and evolving darkness of Pillars Crumble Into Chaos, through to the slow pulse of closing track New American Century, Hush on the Peace Terrain brilliantly captures the effects that current events have had on all of us. A very moving collection of songs, and a very impressive addition to the Synthphonics series. using credit card, cheque or money order. Delivered within 5 days. using the PayPal secure server or cheque. On Stratification, Jamie unleashes a sonic suite of sequences and soundscapes, six songs strung together in a continuous hour long audio journey. 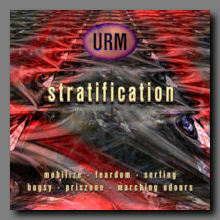 With an influx of new audio toys (lots of new synths, efx and sequencers) in the URM arsenal, Stratification is a tasty mix of sequencer driven Berlin School electronics combined with haunting ambient soundscapes, seasoned with that little bit of weirdness that Jamie has always been so fond of. "One sub-genre of ambient music which hasn't gotten much attention here on the blog is classic Berlin-school spacemusic. Stratification, released for free on the ping things label, skillfully combines the classic elements established by pioneers like Tangerine Dream and Klaus Schulze-- long evolving arpeggiated sequences, light electronic percussion and deep echoing soundscapes in a one-hour flight into analog synth heaven." Stratification is available as a free high-quality mp3 download on the ping things net label. Jamie is also a member of ambient spacemusic group SADU along with Sylken's Eric Hopper and Terry O'Brien from Anomalous Disturbances. 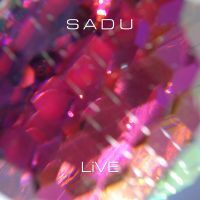 SADU has released both a live CD and a live performance DVD. Each release contains separate performances. The "SADU - LiVE at THE PiNG with General Chaos Visuals" was captured by director David Sloma from a performance at THE AMBiENT PiNG. Visualists General Chaos Visuals fill the frames with their live ambient light paintings and the 5.1 DTS or Dolby Digital soundtrack will envelope you in music. "Directed by David Sloma of Rockin' Films, "LiVE at THE PiNG with General Chaos Visuals" is an impressive DVD representation of a night at Toronto's AMBiENT PiNG performance event showcasing an exclusive live performance by SADU, featuring Eric Hopper of Sylken, Terrence O'Brien of Anomalous Disturbances and Jamie Todd of dreamSTATE and URM. The DVD also represents the first PiNG output from General Chaos Visuals' Steve Lindsey and Eric Siegerman, the brilliant lighting technicians who have helped to create such striking and unique visuals at so many PiNG events. In keeping with the idea of creating community through mutual involvement in projects, it makes sense that this first DVD features such an illustrious collection of PiNG-related talents. SADU is in peak form for this performance, delivering some of the best work I've ever heard from them. Admittedly there are no song titles on the disc to distinguish between works, but throughout the six movements that I was able to identify, each member of the project brings an unmistakeable sound of their own to the music while also working together seamlessly as a group. Terrence O'Brien's guitar playing positively shines in this set, with the DVD displaying an economy of movement in his hands that seems incongruous with the complicated and wondrous sounds that come from his guitar. Eric Hopper performs on keyboards for this performance (as opposed to the guitar that he usually plays for his own solo performances as Sylken) and he displays all the same mastery and skill that I've come to expect from him, coaxing delicate and intricate chords out of the keys that seem to take on a life of their own as they float through the soundspace. 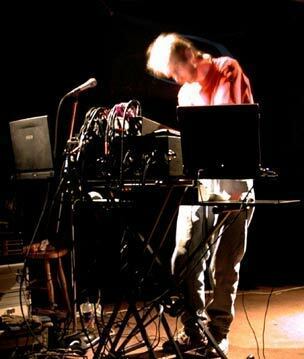 Jamie Todd also puts in a fine performance, the DVD providing a live glimpse of his particularly physical playing technique where movement and motion are all used to trigger and manipulate sound patterns and waves (Jamie also deserves further mention for his very skillful sound engineering on the DVD, most apparent in the wonderful 5.1 mix available on this disc). It's an impressive array of talents to be sure, all working together to create some wonderful music that crosses a wide spectrum of improvisational electronic styles. I'm not really very well versed in the art of cinematography, so I'm afraid that I'm rather limited in my abilities to speak to the cinematic quality of the disc. I can say however that director David Sloma has crafted a stunning vision of the PiNG with this disc, a wonderful and very professional looking live work with multiple angles and very slick editing. In keeping with the collaborative spirit of the PiNG, Sloma has also very cleverly edited in additional footage from General Chaos Visuals' brilliant lighting show which both highlights their unique visions and helps to create a fluid and engaging concert video experience. Certainly Sloma deserves recognition for his success in so effectively presenting a night at the PiNG. There's no question in my mind that all involved with this disc deserve a big round of applause for their efforts to bring the PiNG to a wider audience through this live DVD. 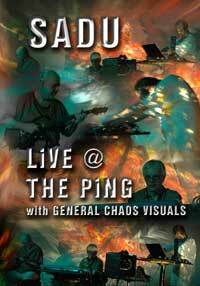 As somebody who has been at literally hundreds of PiNG nights, I fully recommend "LiVE at THE PiNG with General Chaos Visuals" as a wonderful document that captures the sights and sounds of the live PiNG experience. 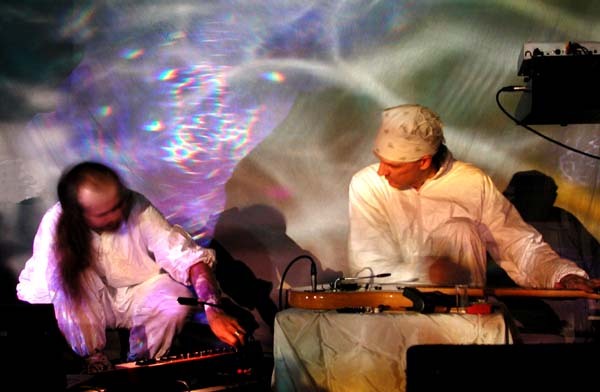 Whether you've been to a thousand PiNG shows or none, if you're a fan of live electronic improvisational work then you owe it to yourself to check out this impressive document."